Do you like to cook? Are you a new cook? An experienced one? Do you just like to help in kitchens? Æthelmearc’s Cooks Collegium this weekend (June 24, 2017) has something for all of you! If creating modern, workable recipes from period texts is baffling, Mistress Rowan de la Garnison will guide you through Basic Redacting. For first-time head cooks who want to learn the whole process of planning a meal and running a kitchen — or experienced cooks who want a refresher or learn another cook’s methods — Master Jamal Damien Marcus is teaching The Feast – Kitchen management to Clean Up. Those who want to focus on keeping their feasts and lunches on budget will want to go to Baroness Oddkatla Jonsdottir’s class on How to Make a Period Dayboard for $2. Afterward, check out the roundtable discussion Baroness Katja Davidova Orlova Khazarina is leading on Saving Feast Costs. Need to improve some cooking or baking skills? Mistress Rowan will show you how to make and roll out Pie Crust! 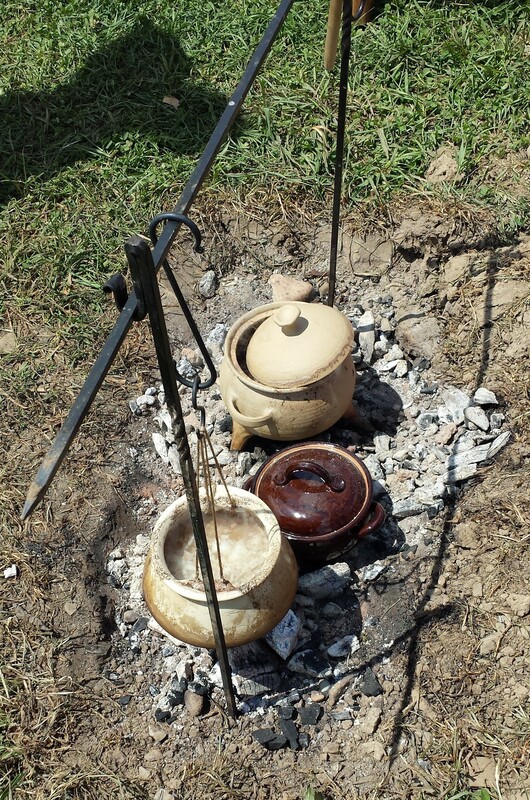 Lady Ragna Feilan walks you through Cleaning and Cooking with Cast Iron 101. Lord Bovvi will teach you How to Clean Fish. And if you’re interested in Cheesemaking, wander outside so Master Gille MacDhnouill can show you how to make a simple soft cheese over the firepit. Speaking of outside…Master Gille is running an Open Fire Cooking throughout the morning for anyone who wants to play with the fire and cooking equipment available. Master Mezaros Janos is making the Medieval Food Lab available all day to teach live fire skills (including maintaining a stable temperature). There are also plans to cook various dishes, starting with simple pottages, baking, and possibly some roasting. Inside, hands-on cooking classes include Baroness Oddkatla’s Introduction to Medieval Spanish Cooking, where you’ll make macrones, figs in the French manner, and roasted almond-stuffed dates, and Mistress Mathilde des Pyrenees demonstration on making Sambocade: An Early Cheesecake. And if you haven’t taken Baroness Sadira bint Wassouf’s always-popular incredibly delicious Dim Sum class… go, don’t question it, just go! Are you a bread baker? Lady Ragna will lead you on A Journey into Viking Bread, while Lady Katerin Starcke will show you how to make Bread From Beer. We didn’t forget about the brewers; Wentliana Verch Meuric and Meuric ap Gwillim will explain how Soda Pop Is Period or the Basics of Fermentation. If you’re trying to figure out what books to add to your personal library, Mistress Alicia Langland has organized a cookbook and food resource library for you to peruse. The books will not leave the library area, but gentles are welcome to use the copier/scanner or snap photos of pages. Mistress Alicia is also leading a roundtable discussion on Medieval Gardens for those who like to grow food as much as cook it! By the way, both lunch and dinner are included in your event registration and all of the food cooked in the morning’s classes will be served for lunch. Yes, everything cooked in the afternoon classes will be served for dinner. Don’t worry — there will be a break to eat, so you won’t miss any classes. See Facebook event group here for the latest updates.